Countless times I’ve told other people with new horses, fretting over this or that, that it takes a year to get to know a horse. 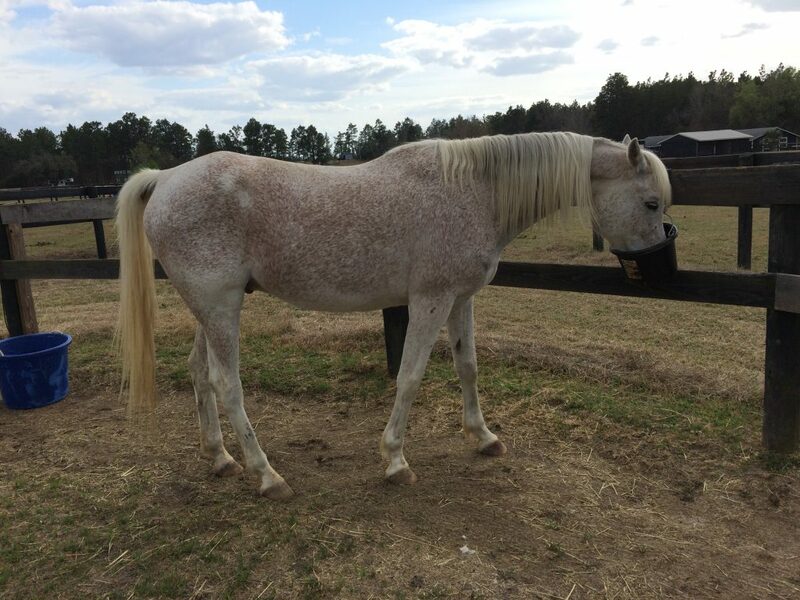 It’s been two months since we picked up a new horse in South Carolina. 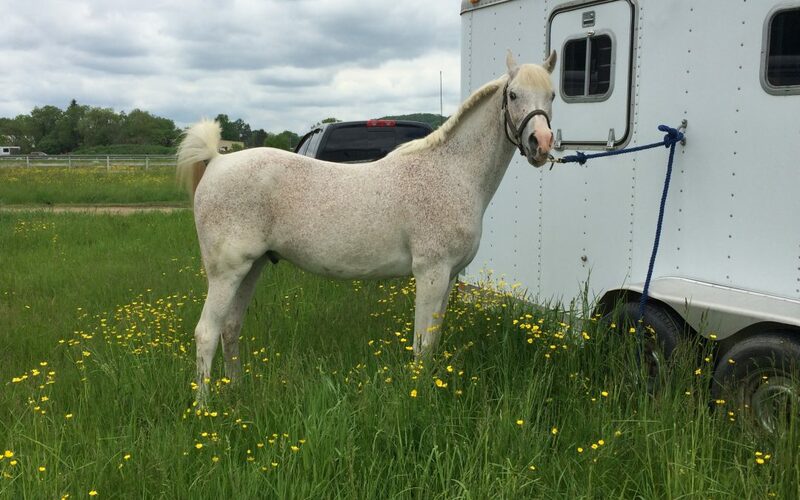 Iggy, as I’ve been calling him, is an 11 year old Arabian who did a 50 mile ride and a couple of shorter rides several years ago, but has been for the most part unemployed for the past few years. He belonged to a friend of a friend who wanted him to go to someone who would take good care of him, keep him for life and see what he could do in the sport. When I met him he was a teensy bit in need of a few pounds, but he mostly lacked muscle, over his topline or anywhere else for that matter. I tried to picture him fit and buff in my mind’s eye, at fighting weight. I liked his bone structure. Iggy on the March day I purchased him. As it was, I bought him for his brain. Unflappable on trail, quiet, happy to go along, and clearly in need of a J.O.B. Two months ago he came home, and I started experimenting. Saddles, pads, bits, bridles. He got his first set of shoes, ever. We toodled around our home trails, up and down our big hills, muddy as they were from an endlessly rainy spring. Iggy let me know that he wasn’t too thrilled about mud, he wasn’t crazy about creek crossings, he didn’t think much of me nagging him with my leg, and he really hated our slightly ADHD border collie mix running up under his nose and barking at a frequency that I believe tickled the edge of the frequency considered audible to humans. He likes to eat, get groomed, loves cookies (to the point of distraction and thus an ineffective training tool), climb hills and go back to the barn. Yes, Iggy is a wee bit barn sour. I’m a big believer in making the right thing easy and the wrong thing difficult, so I’d nag him along (with a whip, which he preferred to my heels) out on trail, and if he was just a bit too happy to get back to the barn, we’d head to the ring for 15 minutes of brain work, or back out the driveway to ride up and down the road a bit. No such luck. I quietly ignored the pouting. Sent him forward, left him alone. Seeking to improve his topline a bit and establish some ground rules about forward and the joy of being in school even though it was raining and the trails were a quagmire, I bought a Pessoa system. Just a surcingle and breeching and a series of bungees, all of which I set loosely to encourage Iggy to work long and low and with his hocks underneath him, rather than trailing out behind. For the first time yesterday, we were able to haul off the farm to condition, heading to our local rails-to-trails camping area, meeting a friend, and just hitting the flat cindered path. The place was packed. Horses, kids, campfires, tents, and all manner of activity. Iggy marched right out, ears up, in the biggest walk I’d experienced since the day I tried him out. He trotted, he cantered, he led, he followed, he looked askance at a railroad tie or two but he was in his element, happy and forward. His throttle had a feather touch and more than once I had to say, okay buddy, slow down a bit. Our friend’s horse took a few bad steps, so we walked the five miles back to the trailer. Iggy led the whole way with a horse that usually walks away from our boys, neck outstretched, marchingmarchingmarching. Tomorrow we hit the hilly trails of Allegany with another friend, a bigger challenge, but I look forward to seeing how he meets it. What’s next? Maybe a slow LD in a few weeks, perhaps a slow 50 at Vermont?